Sabbatical. What sabbatical?! A sunny afternoon temped me out to Goat Lake for a try at the roach. After a wander round to see what had changed since I last fished there in August I carted the gear to the same swim I roach-fished last time, about twelve months ago, and began casting around with an empty feeder to check the weed situation. As expected it was starting to grow and was quite thick in places, needing quite a pull to free the rig. Heading to deeper water found less weed but I wasn't sure that I fancied it there. Having found a line where it seemed reasonably clear in the original swim I started to set up stall. Nothing much had changed in my approach. One block end feeder and two open enders. 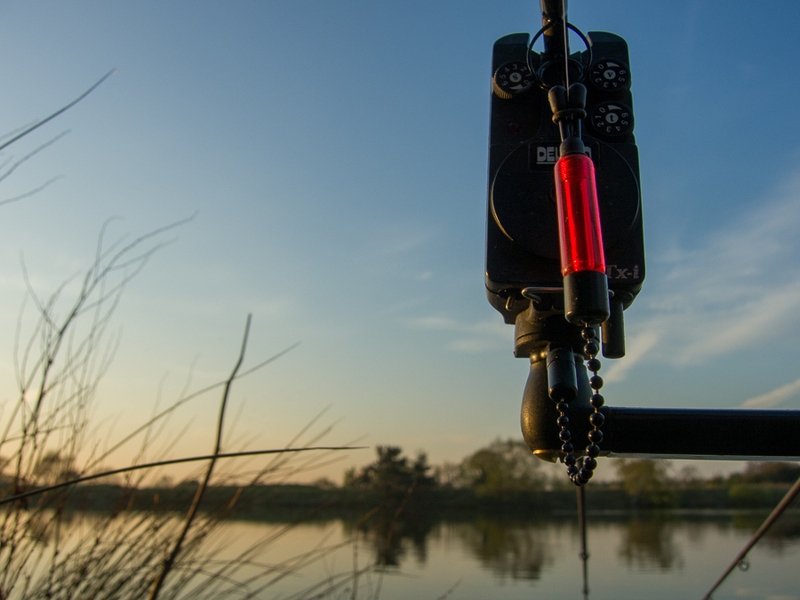 Two rigs fishing a single red maggot each and the other a sleeper with two hair rigged Sonu Band Ums for a laugh. 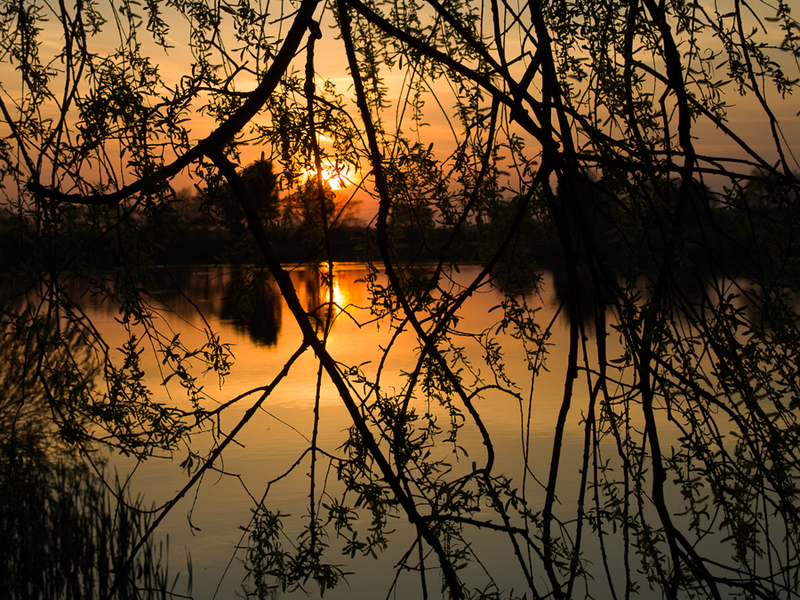 It was four thirty, warm in the sun but cool in the only shaded spot on the bank - where I was fishing... After half an hour I was losing hope. My heart wasn't in it for some reason. I ate my pork pies, drank some tea and thought about packing up around six at the latest. A sparrowhawk swooped over the water and up into a tree behind me. Chiiffchaffs and chaffinches sang their spring songs. It was a lovely afternoon turning to evening and I felt like I was wasting it. Rummaging around in my rucksack I found Fred. No sooner had I put him on watch than the middle alarm began to bleep and the rod top pull up. I lifted into what felt like a reasonable roach. All thoughts of heading for home evaporated as the silvery flank flashed a few feet from the landing net before I managed to slide the fat fish into its folds. On the scales the plump and near-perfect fish went over a pound and a quarter. Well worth coming for. With renewed enthusiasm I began recasting at more frequent intervals. Not every cast was landing clear, and I always wound in to find stringy pale-green silk weed on the rigs. Recasting regularly was a good idea to make sure the rigs were clean most of the time. After a second, sub-pound fish to the middle rod I swapped the maggot feeder to an third open end job.Which seemed to make a difference. The mix of groundbait, 2mm pellets and hemp must have had more allure than the maggots which were surely burying themselves in the silkweed. A couple of fish were hooked but lost when the feeder fouled weed on the way in. There were a few single bleeps to each rod too. Quite often an indication would come soon after the feeder had settled and the bobbin set. Had the bottom been clearer I'd possibly have been better off recasting even more frequently - clearing the weed off the rig every time was a pain though. I'm beginning to think that catapulting groundbait and fishing a straight lead might not be a bad approach here too. That way I could keep the feed going in more frequently without as much hassle. Then again I might be leaving a ig in a load of weed for longer. It's those blasted swings and roundabouts again. The third, and final, fish landed was not so well filled out as, but longer than, the first, and still managed to weigh an ounce heavier. This is just like my chub fishing used to be. Long slim fish and short fat ones - but never long porkers! 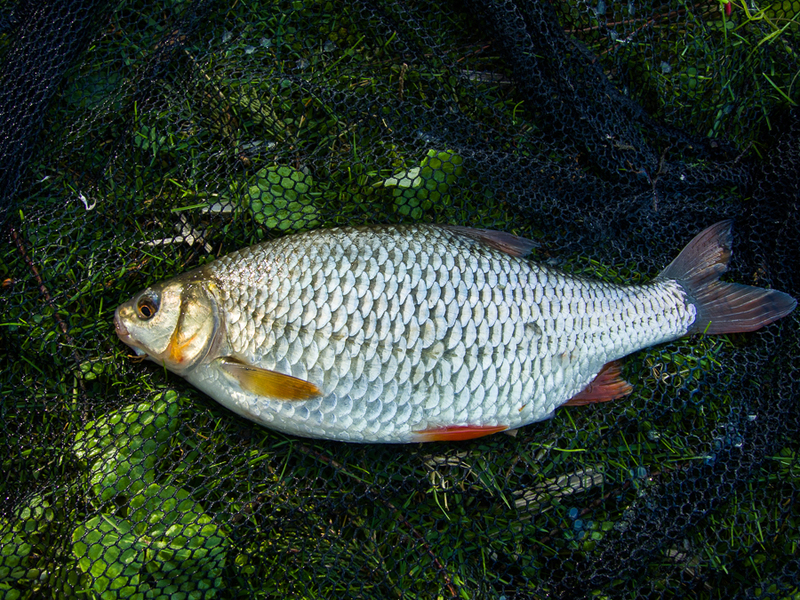 It's nice to catch decent size roach without too many missing scales, though, and especially without the cormorant damage some showed last time I fished the lake. The sunset saw me getting some benefit from it's heat at last. Despite numerous fry dimpling and flipping on the surface as the light began to weaken bites had dried up. I eventually packed up with fifteen or more minutes of daylight remaining. After a despondent start the session had worked out okay and I walked back to the car warm and happy with my efforts.